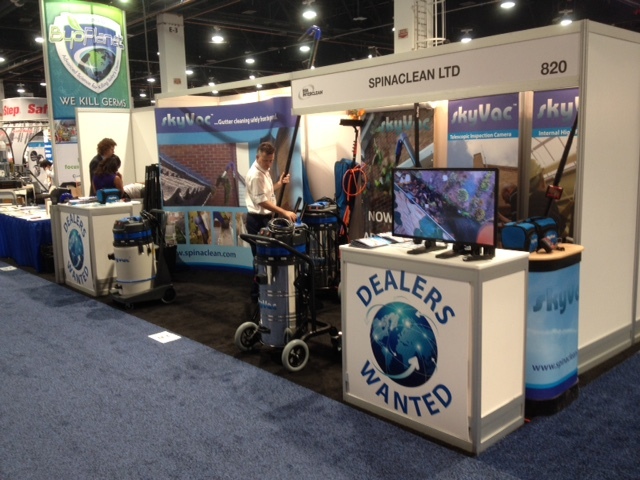 Spinaclean is exhibiting the SkyVac high level cleaning System at the ISSA Interclean show in Las Vegas this week until 23rd October. This is due to the amount of interest, enquiries and orders that we have recently received from the USA. As well as showcasing our products we will be looking for business partners to distribute the SkyVac Range across North America. SkyVac Gutter Cleaning System featuring the SkyVac Industrial System – the world’s most powerful free standing gutter cleaning machine, as well as SkyVac Interior High Reach Vacuuming for commercial, industrial and domestic. Andy and Paul are on Booth 820 – and will be available to discuss with you any business opportunities, answer your queries and give you any information you require in relation to this revolutionary high reach cleaning system.